The NVIDIA GeForce GTX 160M is a laptop graphics card based on the GeForce 9800M GTS (G94b core) and is produced in 55nm. Due to the smaller fabrication process, the power consumption is reduced to the level of the 9800M GS (60 Watt TDP) and is more suited for 15" laptops. As with all DirectX 10 cards, the GeForce GTX 160M renders 3D images using "Unified Shaders". Dedicated pixel- and vertex shaders have been completely replaced with 64 so-called Stream Processors, which take over most of the graphics workload. Furthermore, the shader units are clocked higher than the GPU core itself. As the GTX 160M is just a die shrink, the performance is comparable to the GeForce 9800M GTS. For 2009 DirectX 10 games like Crysis, World in Conflict, Bioshock or Age of Conan, the performance of this graphics card is sufficient for medium to high detail settings. Models include VRAM up to 1024 MB GDDR3. The GeForce GTS 100M series also includes the integrated PureVideo HD video processor. The 160M GPU is thus able to decode H.264-, VC-1-, MPEG2- and WMV9 HD material, thus freeing the CPU for other tasks. HybridPower is a Windows Vista-only technique for switching between the integrated and discrete GPUs for power-saving purposes. The feature was eventually supplanted by Optimus, which can provide smoother automatic graphics switching through drivers. GeForceBoost is not supported with this card as there would be no performance gain from combining with the integrated GPU. The total power consumption of up to 60 Watts means the 160M is more suited for notebooks with relatively powerful cooling solutions. Compared with Desktop graphics cards, the performance of the 160M is most similar to the GeForce 8800 GT, although the latter is still slightly faster due to its higher memory clock speeds. 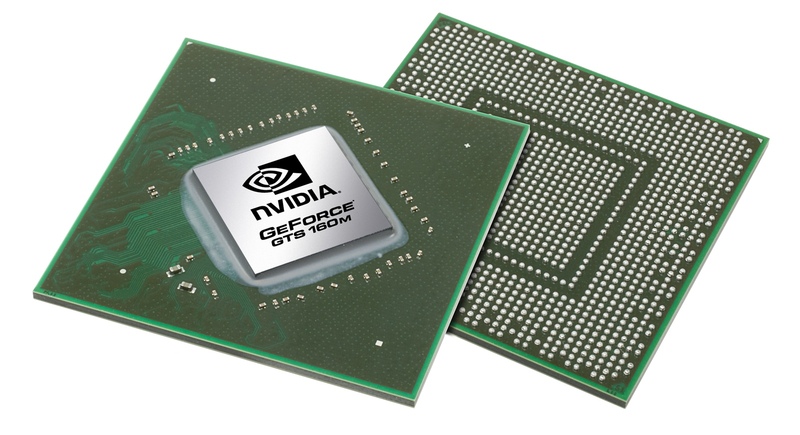 The NVIDIA GeForce GTS 150M is a performance graphics card for laptops (released in 2009) and based on the old G94b core (produced in 55nm). Technically it is a slower clocked GeForce GTS 160M. As far as we know, Nvidia could not achieve a design win for the GTS150M and therefore no laptops and benchmarks with this graphics card can be found.